Thirty years ago this month, the first female FBI agent was killed in the line of duty. 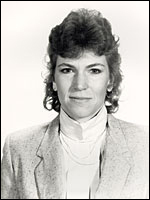 Robin Ahrens had only been a special agent for six months when she died following a shootout on Oct. 5, 1985, the Hudson Star-Observer reports. She was just 33 years old. Ahrens was staking out a Phoenix apartment complex when she was shot by two other agents who falsely believed she was the girlfriend of an armed robbery suspect. Hundreds of people, including FBI Director William Webster, attended the funeral. Posted: 10/7/15 at 9:04 AM under News Story.